In choosing my Top 10 in the restaurant category, there were certain guidelines. In most cases the restaurant should have some menu items that are prepared with beer. A ‘beer degustation’ menu is a plus. If it lacks both of these criteria, it should have a stellar beer selection. However, if it lacks all these criteria, but is a once in a lifetime experience, I list it as I have below in one instance. Denderleew is 19 miles Northwest of Brussels, so it’s a slight drive or cab ride, but one of the best investments you will ever make. De Heeren is a world class gastronomic experience. They serve everything from pub style snacks all the way to a full haute cuisine dinner. Many of the menu items are prepared using fresh ingredients and many are prepared with beer. De Heeren has an extensive selection of beer – 5 taps and over 300 bottles and they specialize in lambics, geuezes and Orval. Some are asking – how do they ‘specialize’ in Orval when there is only one beer? De Heeren is an Orval Ambassador, whish is a designation that they have had training by the brewery on the correct cellar temperature for the beer, the correct glassware, the correct pouring and serving method and other criteria. This is one of a very few places where one can try numerous vintages of Orval side-by-side. A definite stop for any true beer traveler. Chef Stefaan will welcome you like part of the family at this fantastic restaurant. 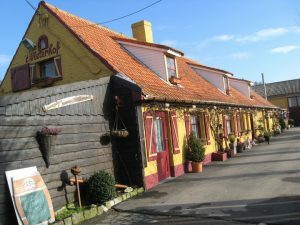 A highly memorable day in your life would consist of a room at the nearby Het Brouwerhuis at the St. Bernard brewery and a dinner at this wonderful restaurant. Stefaan loves experimenting with beer infused creations and has different specials each night. Two of my favorite standards are the Leg of Ham stewed in St. Bernardus Tripel and Rabbit Stew with Het Kapittel Blond. Plan to spend some time here and enjoy every minute. Once again, this will be a lifelong memory. OK, you want beer cuisine? This is the place. Most restaurants that state they offer beer cuisine, have a few dishes that are made with beer; usually no more than 25% of the menu. Well, Restobieres breaks that rule. One will be hard pressed to find much of anything on their menu that is not made with beer. And most of the dishes are excellent. Yes, it can get a bit loud and service can be a bit slow at times; but this is expected in a fantastic restaurant in the middle of a metropolitan city. If you want quiet, try Comme Chez Soi. The only drawback if I had to mention it is that the beer offering is not very extensive; but they do have some unusual beers to try. Some might find Belga Queen a bit pretentious, but it’s fun none the less and highly recommended for any visit to Brussels. It is 4 blocks from the Grand Place near the Opera House. Antoine Pinto, once named one of the ‘Best 100 Chefs in Europe’ dazzles visitors with his culinary creations and his flair for beautiful decor. This former bank has been totally renovated to include the restaurant, an oyster bar, a beer bar and a cigar lounge; each fantastic in their own right. At Belga Queen, all products used in the creation of the stunning dishes are of the highest quality and come exclusively from Belgian sources. Pinto swears by Belgian ingredients, Belgian dishes, Belgian beers and, maybe more surprisingly, Belgian wines. In Belga Queen, several beers such as Palm, Rodenbach, Brugse Tripel and Geuze Boon are both served as an aperitif and used in the food preparation. One will find a whole series of surprising dishes in which beer is a main ingredient. This was the first ‘beer cuisine restaurant’ that I had ever been to in Belgium back in 2001. It is a short stroll from the Grand Place in a quiet neighborhood. Upon first entering your senses will be filled with a delightful aroma and once your eyes adapt to the dim lighting, you will find yourself in a very original Belgian restaurant. Numerous dishes are made from regional beers and the selection is very good. I tend to think this is probably one of the ‘original’ beer cuisine restaurants in Belgium, but no matter – it is very good. 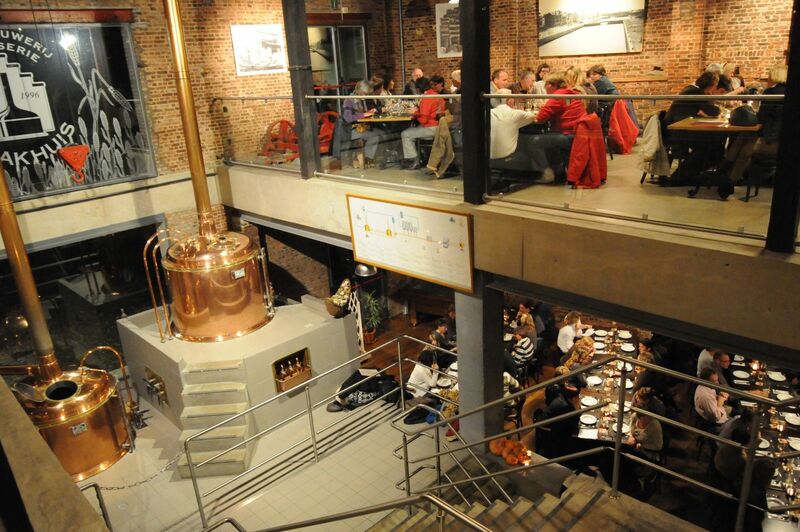 3 Fonteinen is a combination restaurant, brewery and beer shop. Owner/blender Armand Debelder has everything a lambic & gueuze lover would want right here. 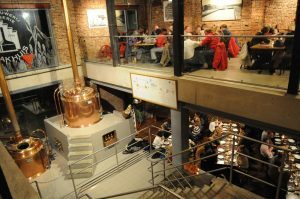 The beer cuisine is to die for and if there is a slight wait for a table, you can pop into the brewery for a quick look. The restaurant is open from midday until 3 in the afternoon and from 6 until 9.30 in the evening seven days per week. This excellent restaurant is well off the beaten path, but they have excellent food and have man y dishes made with beer. It is within close proximity to both In De Vrede and Struise Schoolhouse. I highly recommend the baby back ribs and the stew. They have numerous excellent beers but they do specialize in Struise beers. While I have dined here many times, I am unclear as to their open hours. If they happen to be closed when you arrive hungry, about 5 minutes away is t’ Melenhof, another fantastic restaurant almost caddy corner to the Struise brewery location. 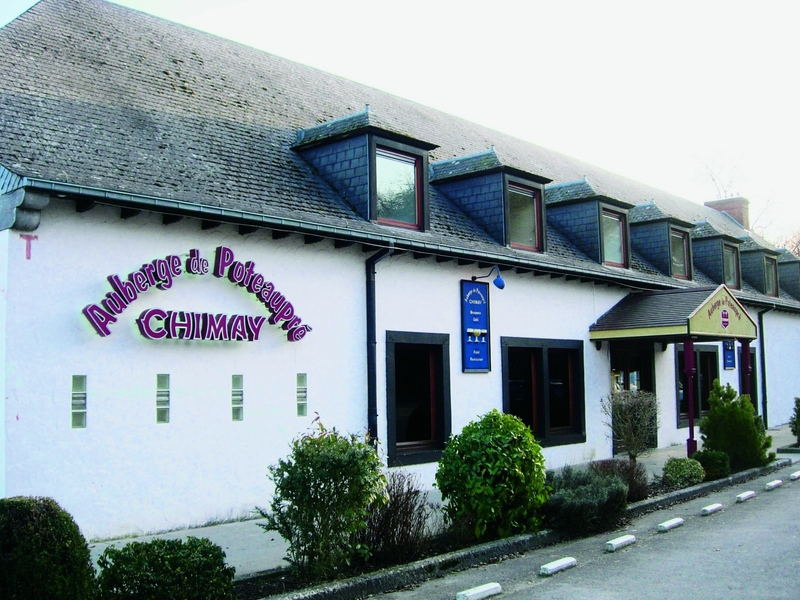 This restaurant is the official tap room and restaurant of the Chimay brewery and several of their creations are made with Chimay beers. If you do visit and don’t try the cheese quiche, then you might have well not stopped; this is incredible. I have tried about a dozen different dishes off the menu and they are all world class. There is also a small museum in the building with all types of beer memorabilia that is very interesting. It also gives a good overview of the history of the monastery which is located about a half mile away. This establishment is owned by the Sterkens family, a Belgian brewing family and is a microbrewery with a great menu. Many o f the selections are prepared with one of the 3 house beers. They are a Blond, a Bruin and a special beer known as Nen Bangelijke (A Frightening One), a dark amber strong ale. There is meat, fish and vegetarian selections to suit any desire and the staff is very attentive. Open for lunch and dinner, another must for the beer visitor to Antwerp. It is about a 25 minute walk from the center, so I highly recommend a cab, especially for the trip back. You will be quite full and content. The o wners call this place “The Brussels Brasserie for Greedy Gluttons and Fine Beer Lovers” and they do fill the bill. The servings are ample and although they only offer a few specialties that are prepared with beer, those and the other selections are very well made. They offer 4 taps and about 30 interesting beers to wash down the good food. Considered to Number 1 restaurant in all of Belgium and one of the top restaurants in Europe. Comme Chez Soi opened in 1925 and has been packing the house since. They serve French cuisine of the highest caliber. This place is not for people on a budget; it IS for those that want a once in a lifetime culinary experience. As a self-professed beer evangelist, normally I would not list Comme Chez Soi, since they do not do beer infused recipes nor do they have a decent beer list; but they are an excellent restaurant. 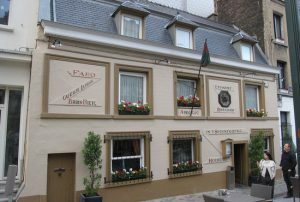 A short walk from the Grand Place, where the visitor will find an extensive beer selection, great bar type snacks and a small menu of dinner items including some beer cuisine. The owner, Patrick d’Hane is a beer lover and has the Orval Ambassador designation for his pub. Also, I removed De Karmeliet, Langestraat 19, 8000 Brugge, from the Top 10 list; not because they are not an excellent restaurant AND they do prepare some dishes with beer, but over the years they have become one of Europe’s top restaurants with 3 Michelen stars, and along with this recognition came the crowds and naturally the price went up…and up.. and up. The chef, Geert Van Eecke, is world renowned and it was under his guidance that De Karmeliet became one of only three restaurants in Belgium to receive the three stars. If you have never been to a Michelen restaurant, I would highly recommend this. It is some of the finest food served anywhere in the world and the service will make you dizzy and you will definitely leave satisfied; but at a very high cost. If money is no object, please try it out.